Alec Bradley Sanctum comes with ornate packaging, setting the table for an out-of-this-world experience.Draped in a Honduran Corojo wrapper, a Costa Rican binder, and a blend of Colombian, Nicaraguan, and Honduran long-fillers, the flavor profile is robust and distinctive. Sanctum is medium to full-bodied with perfect construction and an effortless draw. A sanctum is a place removed from the concerns of the world, a place where you can be safe and at peace, and the Alec Bradley Sanctum line is a very fitting cigar to hold that title. A cigar that you can enjoy over and over, and one that has complex flavors. The Alec Bradley Sanctum has an ornate band with black and and the AB crest, which lets you know from the minute that you pick it up that you have stepped into the realm of Alec Bradley and their fine smokes. Alec Bradley has a deep portfolio of fantastic cigars that you can sample, and they repeatedly score 90+ in many publications, so they’re not making cigars that people don’t enjoy, and the Sanctum is no exception. Whether you find it in your local humidor or you come across a cigar sale online and find that you can get a real deal on one and you haven’t yet tried one, you will be happy with the cigar if you take a risk on it. 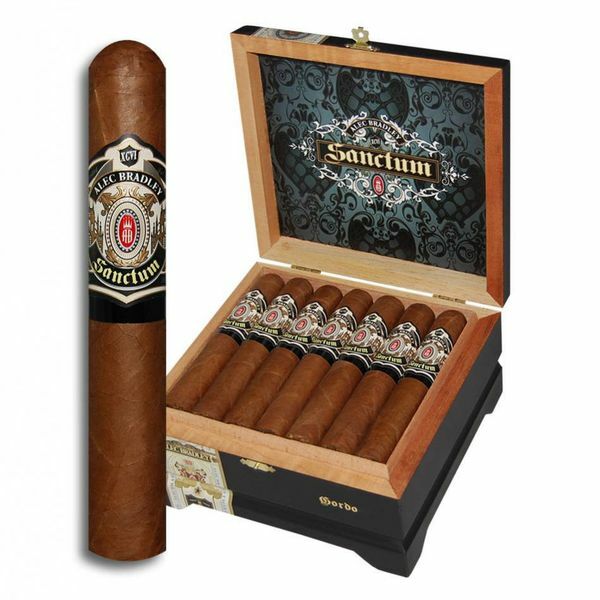 The Sanctum comes with a Honduran Corojo wrapper, into which is placed a blend of Columbian, Nicaraguan, and Honduran long-filler tobaccos, bound together with a Costa Rican binder. The result is a complex cigar that has notes of pepper, wood, spice, and even a hint of fruit to it. As the name suggests, this is a perfect cigar to use to escape the world, to get away for an hour and find some peace within.